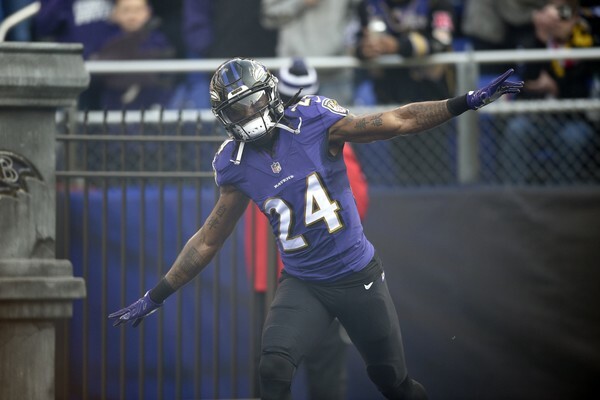 Baltimore Ravens cornerback Brandon Carr received one of the NFL’s highest honors on Thursday, as he was nominated for the Walter Payton Man of the Year award by the Baltimore Ravens. The Walter Payton Man of the Year award is a prestigious award that recognizes NFL players that go above and beyond not only on the field but off the field as well. Prospective nominees devote a great amount of time and effort into community service and charitable contributions. 32 players (one from each team) are nominated each year, and although only one can win the award, the nomination itself is a high honor. Each player that receives the nomination is award with a $25,000 donation to the charity of his choice. Brandon Carr selected the United Way Character Playbook, an organization that teaches middle school students how to build healthy relationships and make good decisions, to receive the grant. Brandon Carr’s devotion to literacy has greatly impacted the lives of many children. He founded the Carr Cares Foundation in 2012, The foundation encourages children to read and provides tools and resources to make this goal a reality. His foundation recently unveiled the Reading Buddy Program, where local high schools students are paired up with elementary school students to create a one-on-one mentoring relationship and to encourage the students’ growth as readers. “The goal of the program is to give students extra help to become more proficient readers, develop mentor relationships, and encourage the importance of giving back to your community.” Carr’s charitable contributions are not just tied to Baltimore. The Reading Buddy Program exists in eight schools in three states, Michigan, Maryland, and Texas. Carr’s foundation plans to add another two schools to the program soon. This is not the first time Carr received a nomination for the Walter Payton Man of the Year award. He was nominated by the Dallas Cowboys in 2015. To learn more about the Carr Cares Foundation, visit the website at http://www.carrcares.org/. To donate, visit http://www.carrcares.org/donations/1207/.